Since its inception in 2007, the Games have grown from a small throwdown at the historic Ranch in Aromas, California, to an international celebration of fitness where the CrossFit community comes together to witness the crowning of the Fittest on Earth and connect with other trainers, athletes, fans, and affiliate owners from around the world. The 2019 Reebok CrossFit Games will take place in Madison, Wisconsin, at the Alliant Energy Center, Aug. 1-4. A detailed schedule of the competition will be released at a later date. During downtime in the competition, fans can take part in many activities. There will be more than 200,000 square feet with vendors and sponsors, a 20,000-square-foot beer garden, space for RV and tent camping, 20,000 square feet of spectator workout space, opportunities to try the same workouts as the athletes, live demonstrations from CrossFit subject-matter experts, and more! The entire city of Madison will be geared up for the Games and offer great opportunities for dining, drinking, and enjoying outdoor activities throughout the city. A Festival Only Package is a ticket bundle that allows access to all competition events with the exception of individual and team events inside the Coliseum. Weeklong Festival Only Packages are $99 (plus a $10 facility fee) and provide access to all days of the CrossFit Games. If you purchase a Festival Only Package, you will have complete access to the masters and teenage competitions, as well as all outside events for the teams and individuals. The Alliant Energy Center campus also will have ample access to video boards where you can take in all the action. If you’re not in the Coliseum, the 20,000-square-foot beer garden is the place to be! A Festival + Coliseum Package is a ticket bundle that includes access to all competition events throughout the day and a reserved seat inside the Coliseum. All individual and team events that take place in the Coliseum will require a Festival + Coliseum Ticket, which designates a reserved seat. Tickets range from $225 to $500 (plus a $10 facility fee per ticket). Price is dependent on the location of your Coliseum seat. With a Festival + Coliseum Package, you will have access to all the individual, team, masters and teenage competitions. With the purchase of a $500 ticket, you’ll be as close as possible to the action in your seat in the Coliseum. 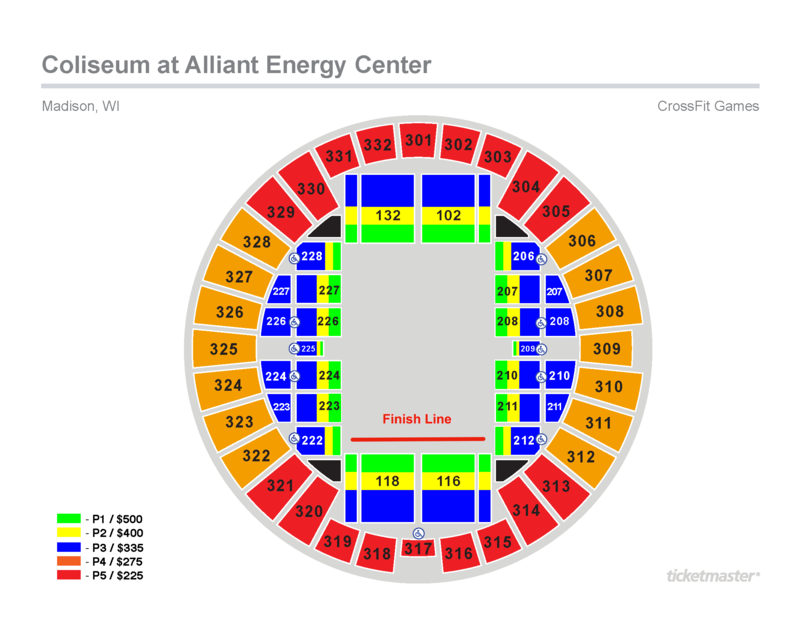 See below for a seating chart of the Alliant Energy Center Coliseum. Kids 12 and under will receive free Festival Only admission but need tickets or passes if they wish to enter the Coliseum or one of the Madison Club locations. Tickets are not required for children 2 and under who do not need a seat. Subscribe to receive ticket announcements and updates. New in 2019: Wristbands will be replaced by Ticketmaster Mobile Tickets. After creating an account with Ticketmaster at the time of your purchase, you can log in to your account at any time to retrieve a barcode containing your ticket package. Each ticket will have a scannable barcode that can be added to your smartphone’s wallet. Note: A screenshot of the barcode will not register. A short video tutorial can be found here. With Ticketmaster Mobile Tickets, the purchaser of Festival + Coliseum Packages or Festival Only Packages will have the ability to send ticket packages (mobile tickets) to anyone they choose through their Ticketmaster account. Each recipient of a mobile ticket will receive an email from Ticketmaster with instructions to create a Ticketmaster account of their own to retrieve their mobile ticket. All ticket holders (not just the ticket purchaser) must create an account with Ticketmaster to obtain their tickets. The easiest way to ensure you have access to your tickets is to download the Ticketmaster app here. Be sure to take advantage of all the functions in your Ticketmaster account here. Instructions on how to use Ticketmaster Mobile Tickets are available here. Don’t have a smartphone or having issues recovering your tickets? Visit the box office directly across the street from the main entrance for assistance. Plans change. Need to sell your CrossFit Games ticket packages? You have the option to sell your tickets, safely and securely, directly through TM+ (linked to your Ticketmaster account). Tickets are 100% verified and cannot be counterfeited. Simply select the tickets you wish to sell, price your tickets, and select the payment method through which you’d like to receive your funds. Step-by-step details for mobile devices, the Ticketmaster app, or computers can be found here. Common questions on selling tickets through Ticketmaster are answered here. The affiliate ticket pre-sale will begin Thursday, April 4, 2019, and last until 11:59 p.m. on Monday, April 8, 2019. Affiliates that had 12 or more athletes sign up for the 2019 Open will get early access to the ticketing website, Ticketmaster, where they’ll be able to purchase up to eight Festival + Coliseum Packages and an unlimited number of Festival Only Packages (must be purchased in one transaction). To gain early access, you must have a code. Affiliate Managers should sign into their account at Games.CrossFit.com and check their competition dashboard to find their unique code, which will allow them to purchase up to eight Festival + Coliseum Packages through Ticketmaster. Codes will be displayed on Tuesday, March 26, 2019. If you are having trouble accessing your passcode, please contact support@crossfitgames.com. If you have trouble processing your ticket order, please contact Ticketmaster at 1-800-653-8000, or check out Ticketmaster’s customer service FAQ. Anyone can use the code. If the Affiliate Manager is not interested in purchasing tickets, he or she can hand the code off to another member at the gym or a friend halfway around the world. There are no restrictions on who can use the code; it’s entirely up to the Affiliate Manager. Keep in mind that the code can be used only once for a single purchase. For example, you will not be able to have four friends purchase two packages each. In that scenario, you will need to have one friend buy eight packages and have the other three friends pay the buyer back. Beginning Tuesday, April 9, 2019, remaining tickets will go on sale to the general public. Following the Open, qualifying individual athletes (National Champions in countries with at least one affiliate in good standing and the top 20 on the worldwide leaderboard after the Open) and Sanctionals winners (to date) will have the chance to purchase tickets in an athlete ticket pre-sale. The athlete ticket pre-sale will begin Friday, April 5, 2019 and end at 11:59 p.m. PT on Monday, April 8, 2019. Note: If you are a Games-qualifying or invited athlete by the close of the Open and have not received an email with details about the athlete ticket pre-sale by Wednesday, April 3, double-check that the email did not get filtered into your spam folder. If the email did not reach you and is not in your spam folder, contact support@crossfitgames.com. Individuals can purchase four Festival + Coliseum Packages at face value. Teams can purchase eight Festival + Coliseum packages at face value. Festival + Coliseum Packages in these respective quantities will be held for potential backfill athletes and winners of Sanctionals events that have not taken place. All athletes competing at the CrossFit Games will receive two complimentary Festival Only Packages. We encourage all family members and friends of potential Games qualifiers to purchase ticket packages during this sale, the initial public sale, or the affiliate sale. Athletes who qualify for or receive invitations to the Games after the athlete pre-sale will have the opportunity to purchase tickets in the same quantities at a later date. Note: All athletes who wish to spectate in the Coliseum will need to purchase a ticket for themselves. Athlete credentials have limited access as a Festival Only tickets and do not provide back-of-house access for those removed from competition. Competitors who receive their codes after the athlete pre-sale ends on April 8 must purchase their tickets within a week of receiving their ticket codes. Games organizers will provide additional information via email. Any remaining ticket packages will be released to the public. In recognition of our servicemen and servicewomen, on Thursday, Aug. 1, 2019, active, reserve and retired members of the military with a valid ID will be granted free Festival access to the CrossFit Games. Fire, police, and EMT personnel with a valid ID also will be granted Festival access. Interested parties should present their ID at will call to receive free admission. For your chance to beat the crowds, have early access to tickets, and watch the competition in the lap of luxury, become a member of the Madison Club. With a Madison Club membership, Festival-goers will have access to exclusive perks and amenities while watching the Fittest on Earth compete. All Madison Club members who purchase passes prior to Sunday, March 31, will have first access to purchase reserved Coliseum tickets for the 2019 Reebok CrossFit Games. Access to two premier hospitality locations. Full lunch buffet Thursday through Saturday, dinner buffet Friday and Saturday, brunch on Sunday, and snacks throughout each day. Beer, wine, and non-alcoholic beverages also included. First opportunity to renew your Madison Club passes in 2020, which allows the first chance to purchase reserved Coliseum tickets for the 2020 Reebok CrossFit Games. Note: The cost of the pass is in addition to the cost of your CrossFit Games ticket. Purchasing a Madison Club pass alone will not gain you access to the Festival grounds or Coliseum. Each Madison Club pass is good for four days of the CrossFit Games. For the ultimate experience at the Games, including valet parking, VIP hospitality, and the first opportunity to get the best seats in the house, consider the Madison Club. Interested parties should contact madisonclub@crossfitgames.com. For the third year in a row, spectators can wake up every morning with other CrossFit fans just a short walk from the Coliseum. RV parking and tent camping will be available for those attending the Games. Camping Rx’d - Quantities Limited! Arrive and be ready to camp in style with an air-conditioned, 16-ft., weatherproof canvas tent, already set up and outfitted with your choice of bed size and quantity. New for 2019: Each Camping Rx'd tent will include air conditioning. Each tent also includes bedding, end table, lantern lighting, power outlet, and more. Camping Rx’d spots are located in a premier location in the campground on Willow Island. Don’t have an RV? Camp on site on a smaller scale. A large number of tent spaces are available on the grass of Willow Island. A 10-by-20-ft. camping space will cost $250 for the week (limit four per customer) for spaces without power and $350 for spaces with power. Festival-goers will have the option to stay in one of the 120+ RV camping spaces located on Willow Island at the Alliant Energy Center. These spaces cost between $1,000 (30-amp) and $1,200 (50-amp) and require a minimum purchase of four (4) Games Festival Only passes. Twenty-five of the spaces include 50-amp hookups. The remaining spaces include 30-amp hookups. Fresh water hookups are available at many of the RV spots. Fresh water will be provided for those who do not have the hookups. RV spaces will be assigned at a later date. After you've made your purchase, if you have special requests or would like to be near another camper, please contact Bryce Dilger at the Alliant Energy Center at Dilger.Bryce@alliantenergycenter.com. Accommodation of special requests is not guaranteed. Looking for a more economical option? At $700, the dry RV and camping option may be what you're looking for. RV spaces will be assigned at a later date. After you've made your purchase, if you have special requests or would like to be near another camper, please contact Bryce Dilger at the Alliant Energy Center at Dilger.Bryce@alliantenergycenter.com Matching special requests is not guaranteed. 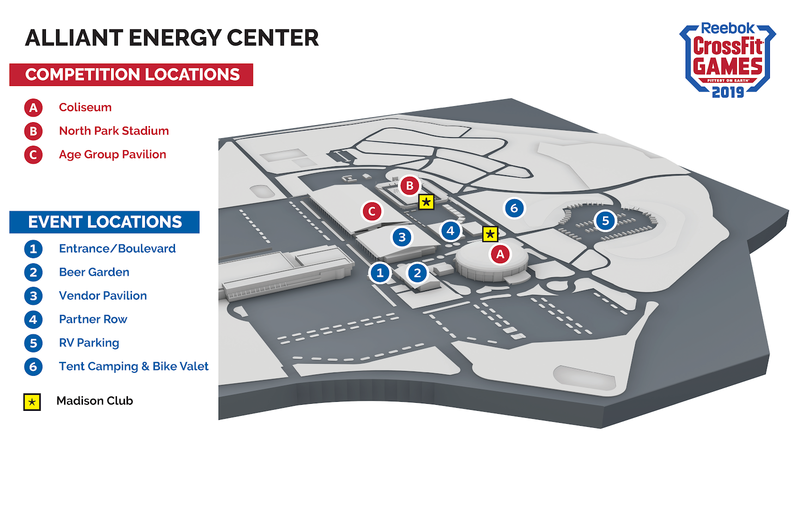 RV, tent, and Camping Rx’d tent spaces will be assigned at a later date, but after you've made your purchase, if you have special requests or would like to be near another camper, please contact Bryce Dilger at the Alliant Energy Center at Dilger.Bryce@alliantenergycenter.com. On-site parking is free, but space is limited. 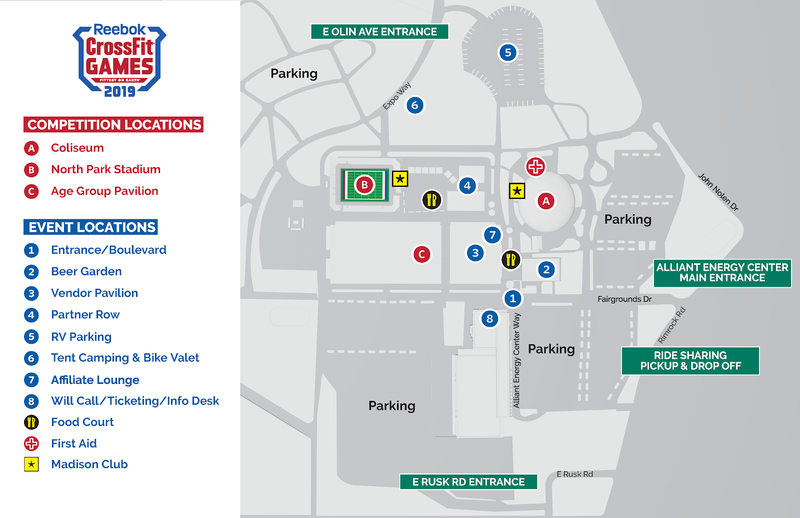 For those located downtown or near the Alliant Energy Center, we highly recommend finding an alternate method of transportation to the Games such as ride-sharing, walking, or biking. For the third year, CrossFit will return the excitement and spirit of the Games to one of the liveliest and fittest cities in the U.S.